Is this really Las Vegas? People are picnicking on a huge green lawn shaded by oak trees and cottonwoods. There’s a cool breeze, even though it’s almost the Fourth of July. The sandstone ranch house looks like a movie set, and the red rock mountains look like New Mexico. Well, it isn’t really Las Vegas, at least not yet. Las Vegas is creeping closer, but one ridgeline still separates the burgeoning metropolis from Spring Mountain Ranch. When you’re over on the neon side, you can’t imagine that a place of such serene and natural beauty could exist a mere ten miles away. 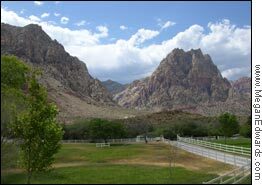 When you’re standing on the lawn at Spring Mountain Ranch, it’s hard to believe you’re anywhere near the Strip. What’s even more amazing is that Spring Mountain Ranch is a public park. The ranch was in private hands until 1972, when the state bought it from two businessmen who were thinking about turning it into a housing development. I can’t say I blame them for entertaining the idea. With its natural water supply and lovely vistas, the ranch was an obvious candidate for subdivision. As it is, though, there’s only one real house on the property, the ranch house built by Chet Lauck, better known at the time as “Lum” of the “Lum ‘n’ Abner” radio show. He dubbed the property the Bar Nothing Ranch, a name that stuck until the next owner, the German movie actress Vera Krupp, renamed it Spring Mountain Ranch. She sold it to Howard Hughes in 1967, having added improvements like a swimming pool and a secret passageway. Nowadays, all the romantic history, which of course extends much farther back than Howard Hughes and Vera Krupp, make Spring Mountain Ranch a natural candidate for “living history” programs. 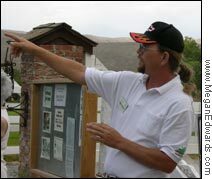 Volunteer docents give tours of the ranch house and other buildings, describing the exploits of not only eccentric billionaires and German ingenues, but also horse thieves, mountain men, early settlers, and Paiute Indians. I joined such a tour with docent Robert Spurlock. As we walked up a path toward the blacksmith shop and other outbuildings, he pointed out the geologic features of the area and described the ancient cataclysmic forces that created the Spring Mountains. He also identified the trees and plants, and told us to be on the lookout for wildlife. Before the tour was over, I had seen two squirrels, a lizard, a jackrabbit, a road runner, and maybe a tiny fish. I can’t be sure about the fish. I was still ogling the unexpected body of water that met my eyes as we rounded a bend in the path. “Lake Harriet,” Chet Lauck named it, after his wife. He built it as a reservoir, but it looks entirely natural. Fed lavishly by two natural springs, it makes the current drought seem far, far away. As Robert described the tiny “pool fish,” an endangered species that coots like to eat, I thought I saw one ripple the surface. 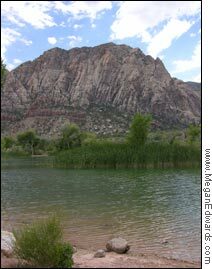 Maybe I didn’t see a fish, after all, but I think that’s the charm of Spring Mountain Ranch. You just know, as you survey the beautiful landscape, that there’s more than meets the eye. This is a place to go back to, to soak up, to enjoy quietly, over time. One way to enjoy Spring Mountain Ranch is to head out there for Super Summer Theatre or one of the other shows presented on the outdoor stage at the eastern end of one of the lawns. You can take a blanket and a picnic and enjoy the cool air—at 3500 feet, Spring Mountain Ranch is always at least ten degrees cooler than the valley floor. But whether you go for the temperature, the music, the history, the geology, or those little fish in Lake Harriet, take time to visit this lovely sanctuary. It’s only ten miles away, but it’s light years from the Strip.